Hi friends, I've missed you, and I've missed sharing my heart with you all. Truth be told, I've sat down at my computer praying over what to write for almost two months now, and God made it very clear I needed to walk away for a little bit. Get my heart realigned with Him, focus on some personal matters that maybe I wasn't supposed to share. I'm an open book and willing to tell all the things, so perhaps God wanted me to hold back some of the things I've been experiencing for just the right time. He's a God of timing, and in this season of truly learning to trust that, I see the value in silence every once in a while. That being said, He's speaking to me loud and clear that someone who will read this needs to hear what He has to say. I hesitate to write anything at all, because this just happened less than two hours ago. It's raw, emotionally trying to my heart, and I'm still trying to process through. I know that what I'm about to write will truly come from what He is speaking to me - literally ZERO time to process and come up with my own thoughts, so here goes. The past two weeks have been a roller coaster of emotions. A span of hope and trust and faith and disappointment and let down. We were convinced our dreams were about to come true, until they didn't - not yet. I stood on God's promises and sang them out like a canary - anyone around me knew what was happening, what would be happening, and exactly the formula for what would happen. I even so boldly said that if this does not come to pass, I am going to look like a complete fool. And yet when it didn't come to pass, I didn't feel like a fool. I just felt devastated. But I've never felt more love. In the middle of this grief and this heartache I feel, I have God, my husband, my friends, family, church - this whole collection and community of people who are holding up my arms when I literally cannot. When I declare I cannot hope anymore, friends circle me in prayer, claiming hope and faith and trust and peace. Overwhelming peace. When my husband sees that look on my face and pulls me in tight and I know that he is always in this with me. When I see concerned glances from my people in church when they see I'm not okay. I feel them all holding up my arms, Aaron and Hur style. Exodus 17:12 When Moses' hands grew tired, they took a stone and put it under him and he sat on it. Aaron and Hur held his hands up--one on one side, one on the other--so that his hands remained steady till sunset. At church today, we went over multiple scriptures that talked about God's faithfulness, and that His love endures forever. I must have heard these two promises one hundred times. My heart needed it, much more than I knew. Today during worship, I raised my hand in praise but I could not sing along, not because I didn't believe the words we were singing - because I was so overwhelmed with my grief and my emotion and my tears. The words could not come out. I felt His presence in that holy moment and He began speaking right to my heart. "My love endures forever. I am faithful. Trust me. Trust my timing. 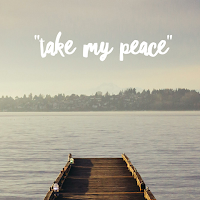 Take my peace". The God of the universe is commanding me to take His peace so I do not ache. The God who counts every tear, every hair on my head, and knows every ounce of sorrow I feel is asking me to take on His peace. I shake my head in wonder and awe at this. You see, I'm angry at God. I'm disappointed and I'm hurt and it's not the kind of anger that would make me turn from Him. It's the kind of anger that is making me turn TO Him, and I think that is the holy difference. 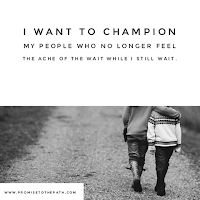 My angst is directed at His will and not in the way you may think - I want it so desperately for my life, and when I felt like I had heard His promises loud and clear, only to be wrong, I realize that I put my own fleshly spin on what He was telling me would come to pass. I wasn't told incorrectly, I heard incorrectly, and that devastates my heart. Maybe you've been there, too. Angry at God because you just can't figure out what He's actually telling you. I know when He speaks to me, I can so easily stop listening and start adding in my own desires, manipulating it to fulfill everything I believe He needs to fulfill. I picture God sitting across from me smiling at me, saying "sweet girl, slow down". I'm happy to realize that my anger is the healthy anger, when years ago it was rooted in bitterness. This is the kind of anger I can take to someone I love and trust. If I am hurt, I will not tell an acquaintance they have hurt me, but this? I can take this to God and say "Lord, I know You hold me in Your hands, and in full honesty I am hurt, I am disappointed, I am angry and I am scared." Reading David in the Psalms allows me to see God appreciates and values our transparency and our vulnerability, and I see now just how close I have gotten to Him. In this I can be so honest and pour out my raw emotion, my sorrow, my grief, my tears, the words I cannot formulate because they're buried in my soul. Jesus is enough. All the time. He is more enough than I can understand. And because He's enough, that means even if my desires don't happen how I want them to or how I think they should, I will still have fulfillment in this life. God's desire, His plan, His purpose, His will, His timing for my life and in my life is going to blow my mind. I know it will. Someday, I will read this words and see this pivotal point in my faith to look back on. I will see how this was the launching pad from another pit I landed in, and I can't wait to see where I end up.